I’ve now been twice to see the Eric Ravilious exhibition at the Dulwich Picture Gallery. I love his work, particularly the watercolours of the chalk downland and chalk hill figures. But I find his depiction of the Cerne Abbas Giant extremely puzzling. The giant is painted brown, rather than gleaming chalk white. It was painted in 1939 and some people have said that the figure was camouflaged to prevent German pilots using it as a landmark. But I thought that the hill figures weren’t covered over until early in 1940. In fact the exhibition catalogue states: “The following year [i.e. 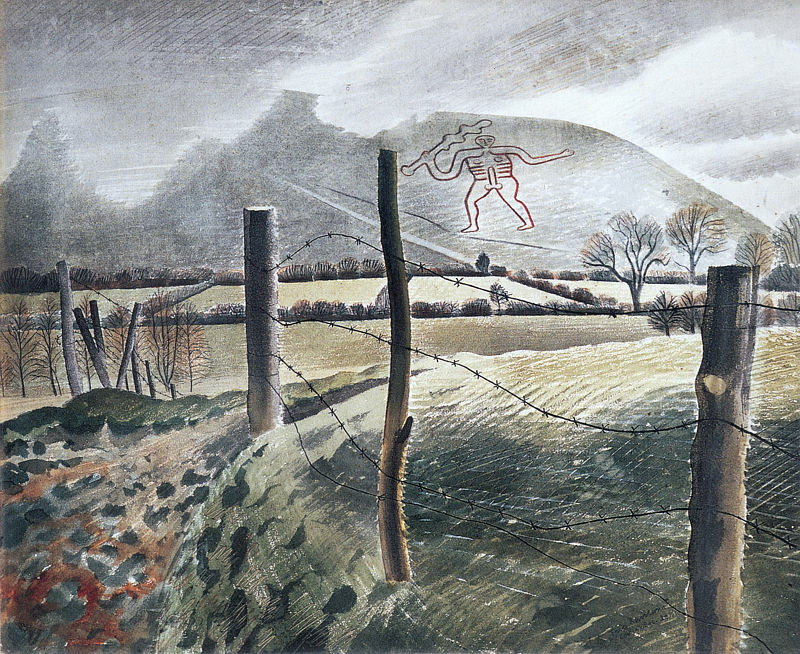 1940 – the year after the painting was made] saw a mass turfing-over of chalk figures, to prevent enemy airmen using them as landmarks.” Despite searching for ages I can’t find any specific reference online that says exactly when the the Giant was camouflaged. I’ve retouched a version of the painting to see what it would have looked like with the figure in white. Much as I like Ravilious’s painting, I think I would have preferred to see it this way. Click on the images to see them larger and to fade from one to the other. Also interesting is how much Ravilious has changed the vertical scale of the hillside in order to give a clearer view of the Giant. Compare with this photograph which I took in 2012 from much the same position. This entry was posted on Monday, July 13th, 2015 at 4:39 pm and is filed under Art, Photography. You can follow any responses to this entry through the RSS 2.0 feed. Both comments and pings are currently closed.